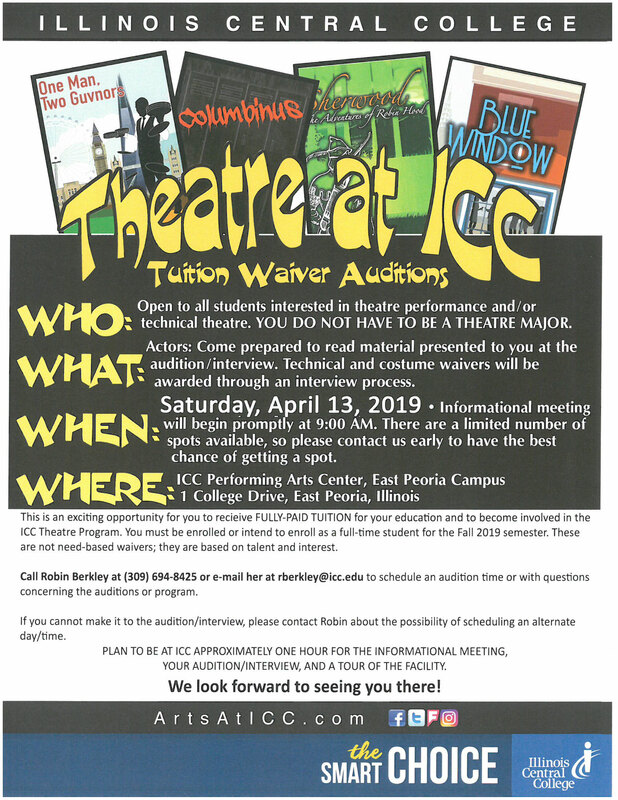 The Illinois Central College Theatre Program will hold its tuition waiver auditions for the fall 2019 semester on Sat., April 13 at 9 am in the ICC Performing Arts Center on the East Peoria Campus. Successful candidates will receive a waiver for partial or full tuition at ICC. Reservations are required. Participants must be enrolled or are intending to enroll as a full-time student for the fall 2019 semester. Waiver awards are based on talent and interest and not financial need. Students do not have to be a resident of the Illinois Central College district to be eligible. The auditions are open to all students interested in theatre performance and/or technical theatre, with or without a theatre major. Actors must come prepared to read material presented at the audition and interview. The process will consist of an informational meeting, auditions/interviews and a tour of the facility. Technical and costume waivers will be awarded through the interview process. 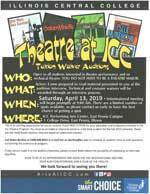 The auditions are offered by the ICC Theatre Program and the Arts at ICC. The Arts at ICC has a rich history of enhancing the arts community and expanding education beyond the classroom. Arts at ICC presents more than 500 exhibits, performances, lectures, rehearsals, meetings, master classes, clinics, seminars, receptions, orientations, forums, auditions and tournaments annually. The ICC Theatre Program produces four shows each academic year, with two productions in the ICC Performing Arts Center Main Stage Theatre and two in the Performing Arts Center Studio Theatre. Students are involved in all aspects of the productions, including acting, props, set building, stage management and technical aspects such as lighting and sound. In addition, the ICC Theatre Program offers an assortment of academic classes, including acting, technical theatre, theatre appreciation, directing and more. For general or enrollment information, visit ArtsAtICC.com or contact the ICC Arts & Behavioral Sciences Department at (309) 694-5113.